The girls enjoyed a super morning of hockey at Rose Hill. Ten schools were represented and split into two pools of five. 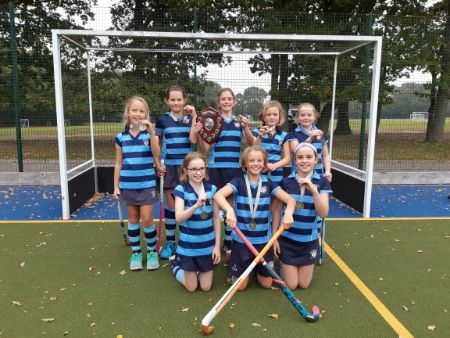 We went from strength to strength and were successful in winning all four of our group matches, against Russell House (4-1), Rose Hill (3-1), Hilden Grange (9-0) and MHS (3-0). Proud and excited by our efforts and results so far, we then met Holmewood House in a nail biting final. Both teams fought hard, scoring twice and resulting in a 2-2 draw at full time. With everything still to play for, we were given 5 minutes extra time to try to secure victory. Mrs Hinchliffe could barely look but through pure desire, passion and determination, we found the space to pass and shoot the ball into the back of the HH goal. The gold was ours! A fantastic team effort, with each individual performing their role brilliantly. Hebe L was superb up front, weaving around the defenders and slamming the ball with determination into the back of the goal on numerous occasions; Clara S was strong as centre half, feeding the ball into the D and also sharing in the goal scoring success. Libby H (who also scored) and Florence M held their space effectively on the wings, providing width to our game and driving the ball forward, as well as racing back to support in defence. Henrietta G and Sydney W were solid in defence, reading the game well and being ready to intercept or put in effective block tackles to secure possession and start a counter-attack. There were no goal keepers, so huge thanks to Polly H and Flora H who joined the squad to offer additional strength and support at the back, clearing the ball successfully. A wonderful and most enjoyable tournament girls. Very well done.